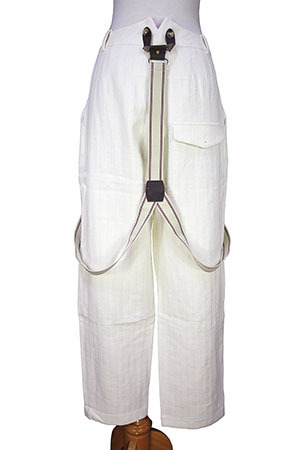 Aleksandr Manamis linen/cotton/hemp trousers with woven stripe with braces. Belt loops and zip and button fly. Buttons for braces. 2 side pockets. Single rear pocket with flap and button fastening. Very classic, slightly baggy trousers. Natural coloured braces with burgundy stripe and leather fittings. leather strengtheners behind each button. Awesome Summer trousers, beautifully constructed in a great fabric and match jacket in same fabric. Sizes are 2 small 48 only.